Is this the Time for Another Revival of the Holy Spirit? Sometimes writing is hard. Sometimes it’s easy. I am in a hard spell. There has been a lot going on in my life and I can’t seem to concentrate on sitting still and writing. This Sunday and last Sunday we had marvellous sermons about Pentecost. Yes, the coming to earth of the Holy Spirit. The fire — the life — the revelation. Free and sovereign mercy — God did this. We have to remember that God brings revival. So what do we do? Here are the first great revivals. Jonathan Edwards and George Whitfield are names from that awakening. James McGready and Charles Finney are names from that awakening. Is it time for another awakening of hearts and spirits? Revivals happen in a period of moral decline. Look at our world: sexual abuse, disgust with those running governments, corruption, killings, and fear. We have screen abuse so we are no longer talking face to face with others. Our reading skills are declining. Prayer stimulates our hearts and souls and sends a signal to God that we are ready to see Him in action. Those who teach from God’s Word are speaking into the hearts of the people. Do you want to see God’s spirit move in hearts? I always love this song by Robin Mark. Revive Us. God has put it on my heart to gather believers together, to grow through God’s Word and prayer. I would like to start a collection of revival, restore scriptures that we can pray. Please add your scriptures in the comments. Thanks. We need to be connected. To pray together. Join us at Artists and Writers Grow Through God’s Word. This entry was posted in Word of God Speak and tagged Holy Spirit, prayer, revival, Scripture, word of God on May 24, 2018 by JanisCox. Someone asked me if I could do something. I had to say, “I’m sorry at the moment I have no time”. I even said that I wished God would give me another 24 hours in a day. But you know what, He answered me and showed me how to not be concerned with time. This is the grandfather clock my hubby built. We are continuing with week three of a Lenten study using The SIMPLE Method of Bible Study. S – Say the passage out loud. Check other versions. I – Interpret the passage – check footnotes, references, and commentaries. Find out all you can about the passage. When? Where? Why? Jesus had just cleansed and cursed the temple. The religious leaders wanted to destroy Him. This is the first of 5 controversies in the temple. Tension is building on the way to the cross. The temple courts were courts that surrounded the main temple buildings. There was the court of women, court of men (Israelite) and court of Gentiles. What authority? Priest wanted to know why Jesus could perform an official act when He had no status. “Heaven” was a common word for “God”. M – Make list of thoughts, questions and ideas. Those who called themselves “religious” should have understood Who Jesus was. But they didn’t. They were blinded by obstacles. I was too – See my faith testimony. The priests had become powerful. They had money and position. They saw Jesus as a threat to that. They reject His authority (28) – See Mark 1:22, Mark 1:27, Mark 2-10-11.
Who is our authority? Is it science, the world, the media, other people, ourselves? I read A Case for Christ by Lee Stobel and books by CS Lewis, Max Lucado and of course The Bible to help me answer the question Who is this Jesus? It’s a great question that Jesus posed. The evidence is seen in Malachi 3:1, Isaiah 40:3 and by John the Baptist. But even with all this evidence the priests could not get over themselves and the possibility of losing control. Fear of man is a common problem (See Proverbs 29:25). The leading Jewish authorities were afraid of the people. So they waffled and said, “We don’t know”. They wanted to stay safe and comfortable and keep the status quo. P – Pray – after all your thoughts are expended – take time to talk to God and then to LISTEN to Him. I think it is amazing how God works. This is the passage suggested in the study I am following. And last Sunday it is the text that the sermon was based on. Our pastor, Rick Thiemke, if Via Church in Mesa, Arizona, explained the passage very well and many of my thoughts came from that sermon. I love this quote. Remember the burning question I had this week: How can I get more time? I am learning to never say never. God is the God of the impossible. Being God-led means submitting to His authority. I was reminded of two old acronyms and one new one. T – Thankful: Be thankful for each moment of the day. I – Interest: Show interest and understanding and watchfulness for events around you. M – More: God gives us more than we need. 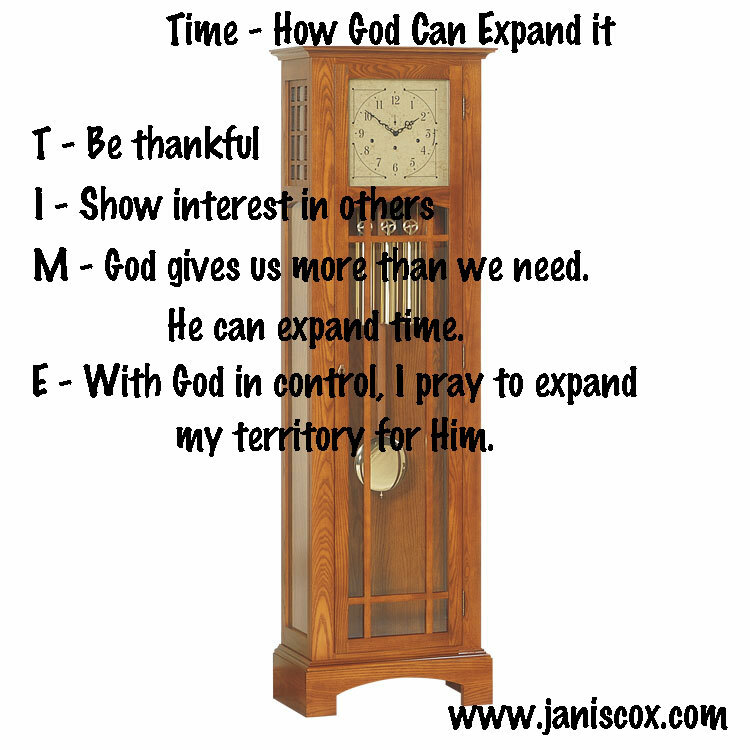 He expands time, energy and vision. E – Expansion: Our world expands when God is in control. I pray to expand my territory for God. How do you see TIME? God’s version is different than ours. The scripture to study for this week will be Colossians 1:17 because I think it encapsulates all the ideas of TIME. E – Exit the study with a written prayer of confirmation, forgiveness, praise or acceptance. Oh Father, once again You amaze me of how You put things together – this day, this week, this year. The sermon, this Lenten study, Your words through prayer. You tie is all together. You hold everything together. You even expand time. Thank You. In Jesus’ name. Amen. 2. Would you like to excite your study of the Bible — Join me for a free Bible Art Course — Sign up now. 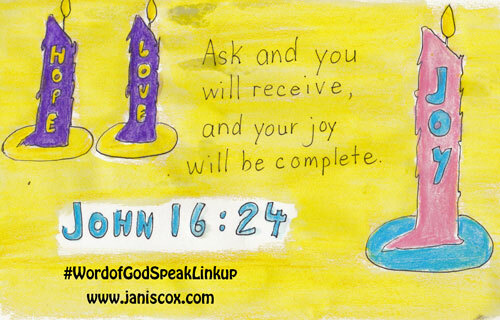 Sign up for the free email Bible Art Course by Janis Cox. This entry was posted in Simple Bible Study, Word of God Speak and tagged authority, focus, Lenten study, listen, Mark 11:27-33, SIMPLE Bible Study, time on May 10, 2018 by JanisCox. Can the Word of God come ALIVE to us? I will be starting a new FB study – Psalms Alive using David Kitz’s book, “psalms alive” (yes no caps). He has generously offered his book for anyone who wants to join this study. Some of you may have read this in my newsletter. You can sign up here to join my newsletter if you aren’t part of that and want to be. You must be on Facebook to join psalms alive. Sorry. God speaks to us – to humanity – through His Word….. How do we draw meaning from these words?…can the Word of God come alive to us and speak to our hearts? Are there insights we can gain by looking at the prayer and devotional life of the ancient Hebrews? That speaks to me. I want to go deeper. Don’t you? I will use the SIMPLE method of study for each of the chapters. You can follow that or do what you need to do. I will be drawing, painting, and lettering as God leads me. You can do that or just let God speak to you as He does, which is different for each person. You can find this study on Growing Through God’s Word FB. Ask to join. 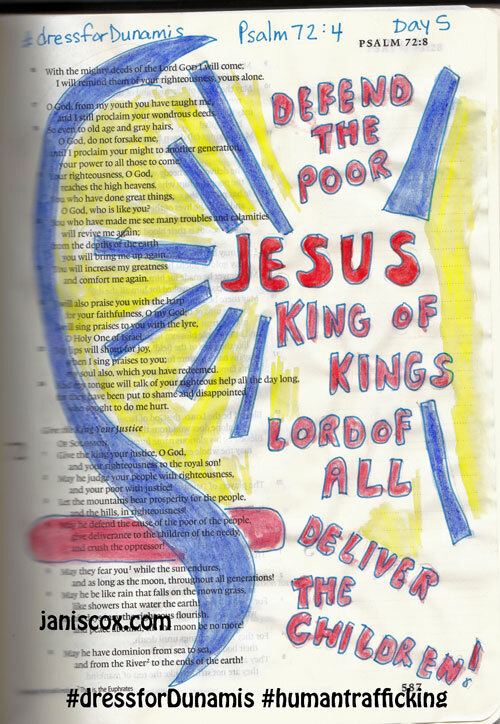 Psalm 19:4 – I started David’s book … just a quick look and a sketch. This entry was posted in Word of God Speak and tagged Bible study, David Kitz, Facebook, psalms alive, Simple Bible Study Method, study on October 11, 2017 by JanisCox. 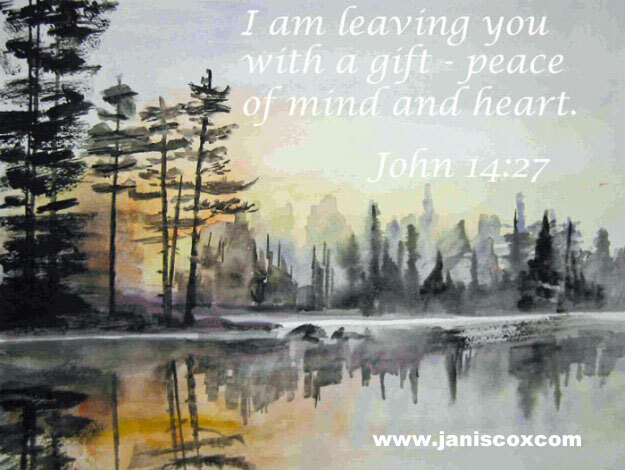 Bible Painting – Have you tried it? Word of God Speak – Bible Painting – Have you tried it? 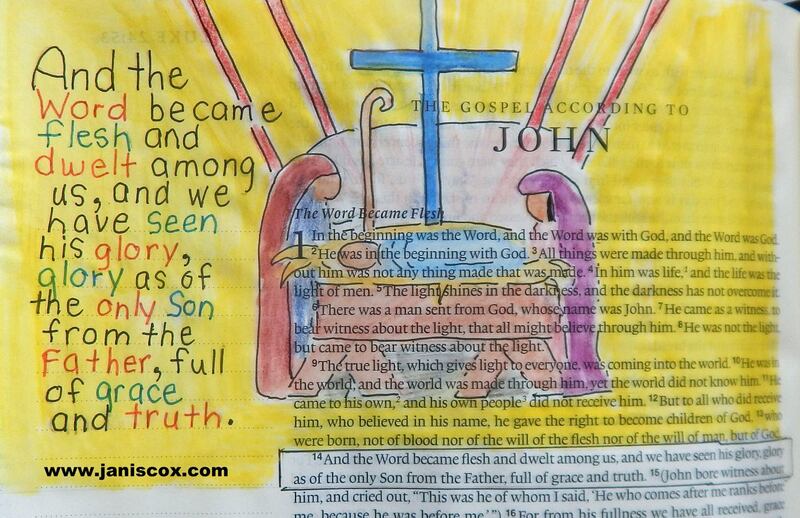 Bible painting or journalling – what is it? I posted this a year ago. I have continued to work on my Bible painting/journalling. 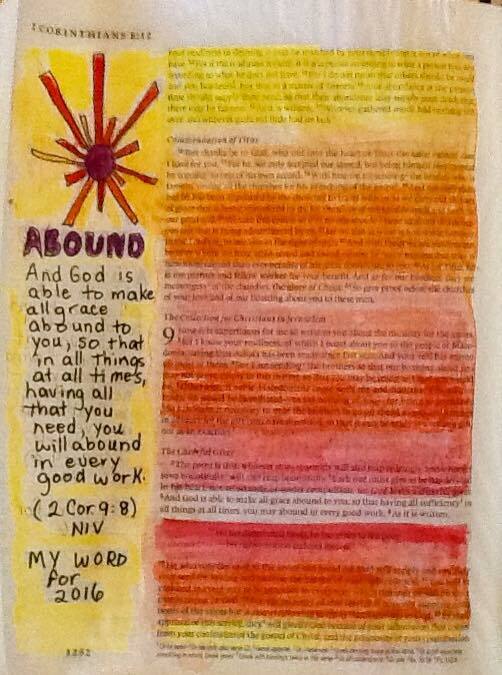 Check out my Bible Journalling Page for more scriptures and pictures. I now have a link in my menu for Bible Journalling. Check it out. Join us on Facebook Word of God Speak. I use watercolour pencils and felt pens and Micron pens. Bible painting is something new to me. 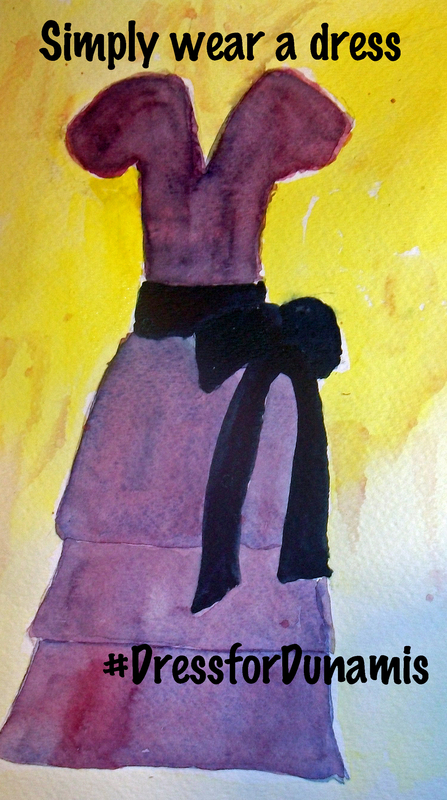 I would like to show you this week some of the watercolour paintings I have done in my Bible. 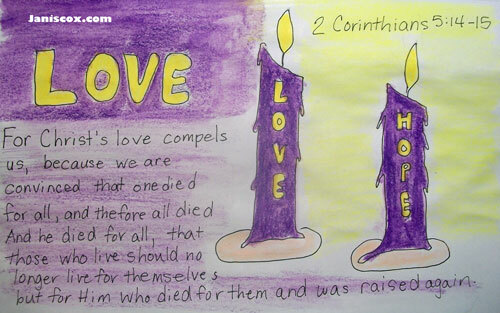 I find, being a visual person, Bible painting helps solidify the scriptures in my mind. It’s time for a review. I have studied, painted and memorized a number of scriptures since we started Word of God Speak. Each week I would use the SIMPLE method of Bible study to hear what God was telling me. Here is a quick review with the scripture, my Bible journalling page, and my thoughts for each scripture. I am only doing a few of them this week. Next time I will show you new ones. Review is important. It’s time to go back and see what I have learned. If you haven’t been following you can click on the link to see my thoughts of each scripture. 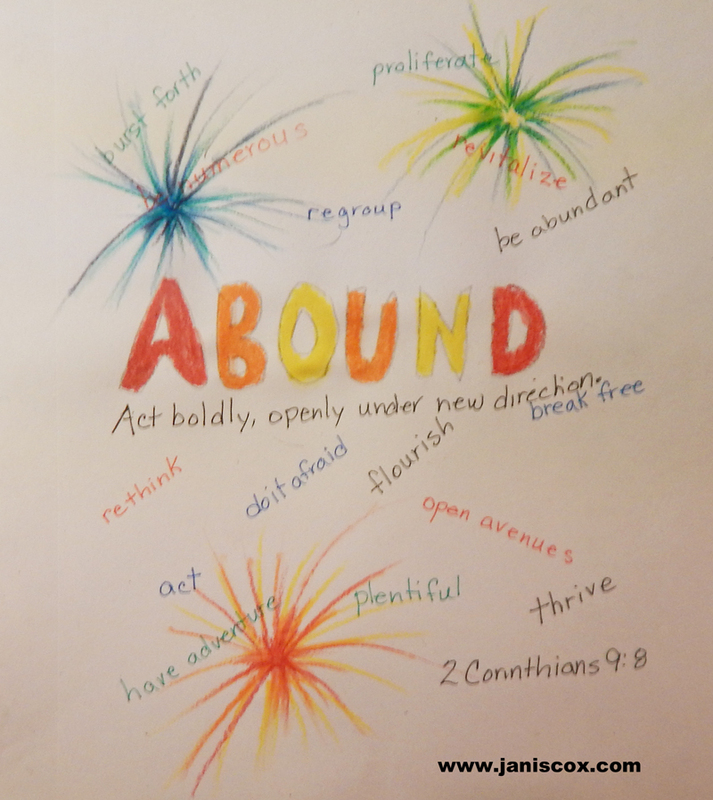 2 Corinthians 9:8 Have you found one word for 2016? John 1:14 What does it mean God came down? I know God is leading me somewhere. Therefore, I will continue to watch where He leads. We are called to look after those who cannot look after themselves. I thought, “What does it take for the Spirit to move in the hearts of men? in my family? in my friends? I remember before I took that leap of faith, being prideful, and stubborn. So it takes the power of the Holy Spirit to break through our tough skin. 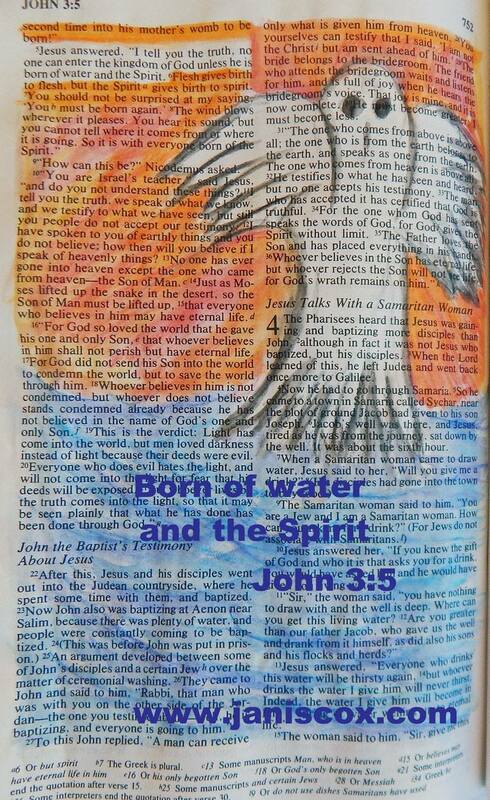 This entry was posted in Watercolour, Word of God Speak and tagged Bible Journalling, Bible painting, lessons, Review, Scriptures, SIMPLE Bible Study, Word of God Speak on January 7, 2017 by JanisCox. It is December 13 and I am writing this post. We head back to Canada tomorrow and will return before you have read this post. Find out below how I came to pick the word “finish” for My Word for 2017. I have been working hard at listening to God’s Word and painting in my Bible journal the pictures He is showing me. I work at promoting my children’s books. I have new opportunities I want to check out. God can pour on the blessings in astonishing ways so that you’re ready for anything and everything, more than just ready to do what needs to be done. As one psalmist puts it (The Message). And God is able to bless you abundantly, so that in all things at all times, having all that you need, you will abound in every good work (NIV). I found my Word – Finish – for 2017 this week. It is from Psalm 138:8 (tweet this). do not abandon the works of your hands (NIV). Your love is eternal—don’t quit on me now (The Message). As I was finishing off this post I drew a Bible Journal picture on Day 25 – Christmas Day – Romans 8:14-15). I now have another word to go with Finish – GO. God will finish what He started in me and I will go where He calls. My Word for 2017 is Finish. God is leading me in many directions. I am not sure which ones He wants me to follow but I am listening. I know He has plans. But I must stop and listen so He can continue to work in my life (tweet this). For that reason I will no longer be doing Word of God speak Linkup. I need to be freer to follow His lead. Although I have loved setting this up and meeting wonderful bloggers, my readership has not grown in the past year. I believe that is because I am hemmed in and not able to do it “His Way”. I think I will meet more of you as I travel and comment around the blogosphere. So I am crying out to the Lord and asking to do it “His way”. I may not blog some weeks – others I may blog 2 or 3 times – depending on what He tells me. I need Him to finish what He has started in the past few months (tweet this). Here is a poem I wrote while studying this verse. As long as You are by my side. For this reason I will work on reading His Word – I study it, paint it sometimes, write or podcast about it. Maybe I will speak it live. I will continue to podcast for Hope Stream Radio. I want to reach 100 – I am at 72. And then we’ll see where God leads me from there. This is what I feel He is telling me on December 13 as I work through the Dress for Dunamis fundraising. Praying for a shelter for these girls. Praying for their protection. Check out the post. Please mark your cheque in the memo line as The Dunamis Foundation. Tax Receipts will be given for over $10.00. You can find a donation page here. We welcome your support. 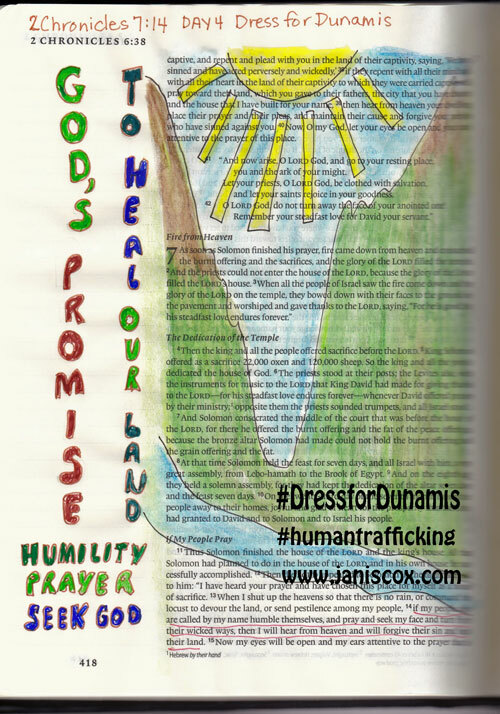 Please find us at Dress for Dunamis Page on Facebook and the Dress for Dunamis Facebook Event page. This entry was posted in Word of God Speak and tagged abound, Dress for Dunamis, finish, last linkup, NIV, psalm 138:8, The Message, word for 2016, word for 2017 on December 31, 2016 by JanisCox. I pray that this post reaches you with joy in your heart about the birth of a baby – Jesus. It is all about that baby, isn’t it? I watched a fantastic production put on by the kids at Via Church here in Arizona. I have never seen such diligence, enthusiasm, clarity of speech, joy and love in any children’s performance before. Excellent. They really taught the audience that it was all about that baby. Today it still is. So no matter where you are, what your circumstances are – please remember that statement. Put your faith in Jesus – He is the way, the truth and the life. If you have missed the podcasts on Advent you can listen to them all here on my page for Hope Stream Radio. 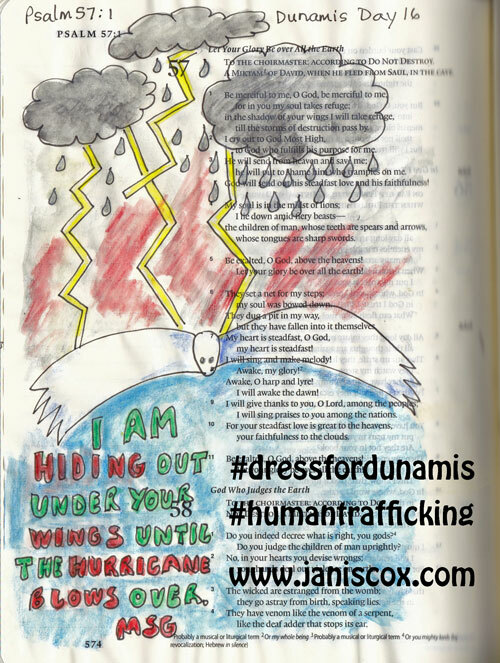 I have one week to go in wearing a dress for the month of December in support of the Dunamis Foundation in Ecuador. If you wish to contribute please read the post called Dunamis. This is my little Christmas dress I picked up from the Thrift store for $10. I have worn it many times this December. I wear a little card that says: Ask me why I am wearing a dress. In this picture I have my name tag on as I went to a Christmas brunch at our church. For your viewing pleasure here is Mark Lowry singing Mary Did you Know. This entry was posted in Word of God Speak and tagged Jesus, life., Merry Christmas, that baby on December 24, 2016 by JanisCox. 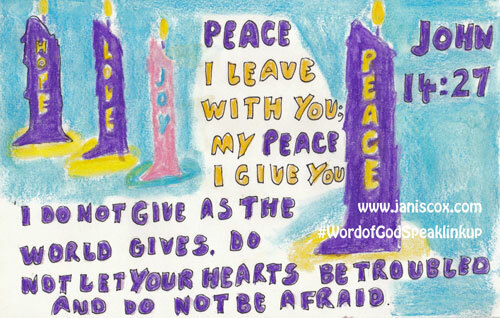 This is the last week in Advent – Advent 4 – Peace. I put everything aside. I am lighting the 4th advent candle. Finding peace means to do an action – put all worries, stresses, extra thoughts that entangled us – put all those ASIDE. When you do that Christ will enter. He can focus you on what needs to be done – even if that means doing nothing. I thought it interesting that part of the definition was freedom of the mind. We know Jesus gives us freedom but did you ever think of that in terms of your mind. Your mind rules much of your body. It can tell it to flee or to stay; it can make it feel joyful or sad; it can think of different ways to do things; it can learn. Therefore I know I need to put everything aside and then I can have that freedom of my mind. I noticed the word “obsession”. What obsessions do I hold that I need to throw off? Certainly, I know that I obsess when things don’t go the way I planned. That does bother me. I think everything should run the way I see it running. And don’t get in my way. I know – that’s wrong. But do you do that too? How can I throw that off? Here are 3 ways that help me when I feel frustrated when things don’t go my way. My favourite is I say to myself, “It is not about you.” The world does not revolve around me and what I want. I have to say that over and over. Here is Max Lucado’s article on It’s Not About Me. It’s a very good read. Counting to 10. I learned this one while teaching primary school and with my own children. If I can count to 10 my anger has time to cool down and I can get to the bottom of a situation and still remain at peace within myself. Head for the washroom. Yes that is my oasis – my safe place. If I can get there before my emotions boil over I have a few minutes to regroup and keep my peace before tackling the problem. In each example I am able to put everything aside – find Jesus – then regroup and go back and act in a peaceful manner. Let’s work with that peace. Let’s love with peace in our hearts. And wishing each and every one of you the hope, love, joy and peace that Christmas brings. In addition here are 4 others posts I have written over the years about peace. If you need peace today check them out. What’s Another Word for Peace? Sunday Stillness – Can You Find Peace? 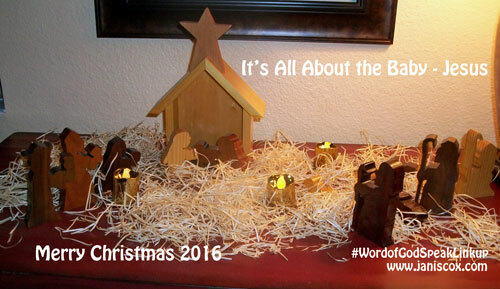 Today is Word of God Speak – a linkup for your wonderful posts. Join us. This entry was posted in Word of God Speak and tagged Acronym, Advent, finding peace, peace, put everything aside, week 4 on December 17, 2016 by JanisCox. This week has been full – full of good things. But sometimes a little hectic too. 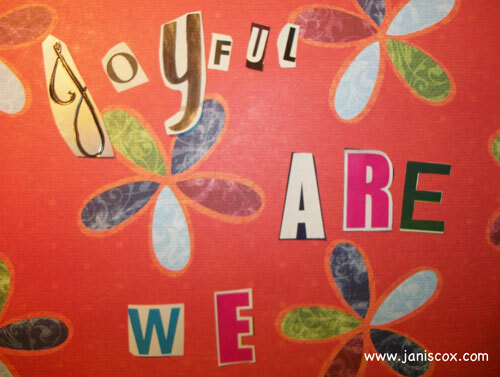 Where do I find Jesus joy? Today I light the third candle in Advent – Joy. Life is. Life happens. How I go about my life is how I see it – How I see it, view and live it. I am not talking about the bubbly joy that comes sometimes, or the excited joy when I see family, or the exuberant joy I get when I dance. 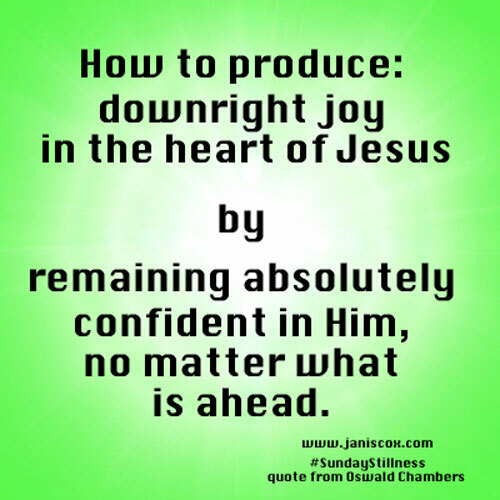 It is the joy that Christ gives me that keeps me going and going. That joy can only be found in Jesus. When I focus on Him and let Him lead there is a wonderful feeling of “rightness”. It doesn’t mean I’m happy, or giggling or smiling. I’m just okay. I’m just all right. And He does. I can’t tell you how He does this. But when I am not striving, or full of my agenda, He brings life to me; He shows me things to do and I do them. He gives me the time, the inspiration and the fulfillment. Today is rest today. I am going to end with a series of pictures of the past couple of weeks. Have a Jesus-filled, joy-filled life. Wearing a dress every day in December. I need an apron to cover up. Susie Homemaker? 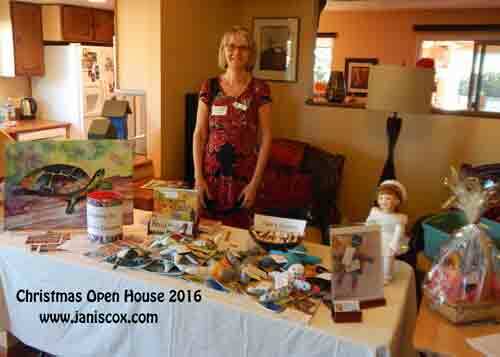 A wonderful Christmas Open House. Great chats. 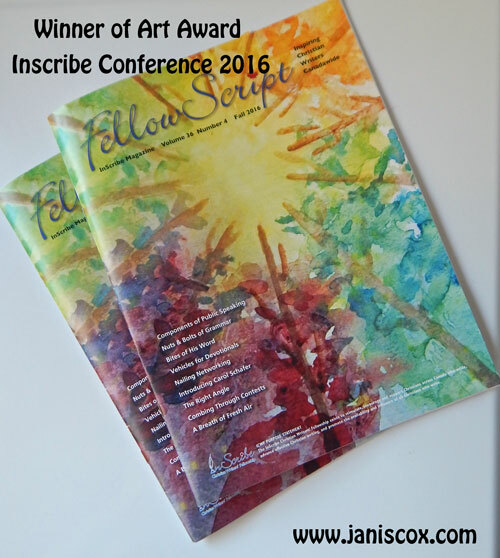 And I am delighted that my painting from The Kingdom of Thrim won the Inscribe Art Contest and is featured on the cover of this month’s Fellowship Magazine. I linked this post to FMF as the topics were the same this week. JOY. You can join in Kate’s challenge to write for 5 minutes on Fridays. Go here. 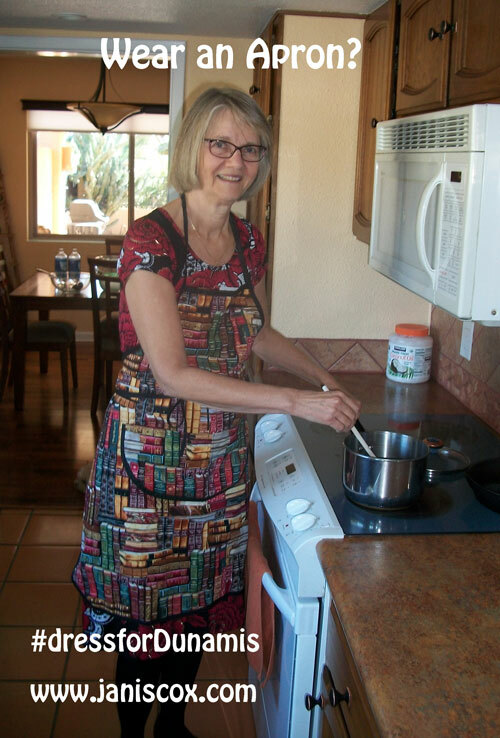 This entry was posted in Word of God Speak and tagged Advent, Dress for Dunamis, Jesus Opens You, joy, open house, Oswald Chambers, Tozer, Week 3 on December 10, 2016 by JanisCox. This week is the second week of Advent. Last week I lit the internet candle for HOPE, and now I light it for LOVE. So let’s love this week. But God demonstrates his own love for us in this: While we were still sinners, Christ died for us (Romans 5:8, NIV). What more love do we need to see than this? – Christ died for us. I learned a few things in our sermon last Sunday (they seem to have the order different than my church in Canada. They started with LOVE. But Noah was different. God liked what he saw in Noah. Because of Noah, the earth got a reprieve. The plan was in place for the redemption of man by Jesus. I had to highlight those words – My ego is no longer central. I pray for a working in that. And Christ lives in me. I know that and praise God for it. I’m learning the phrase: Let’s love. Me again. I always get in the way. Do you? I know I can’t change myself but God is doing a work in me. Praise Him. Thank You Jesus. I’ve been reading A.W. Tozer. The whole work of God in redemption is to undo the tragic effects of that foul revolt, and to bring us back into right and eternal relationship with Himself (Tozer, The Pursuit of God). So here I am faced with the amazing love of God and know that I need to learn that love. The world pulls me in other places. I need to stop and look to God and not the world. I need to be different. I need to learn, let’s love. 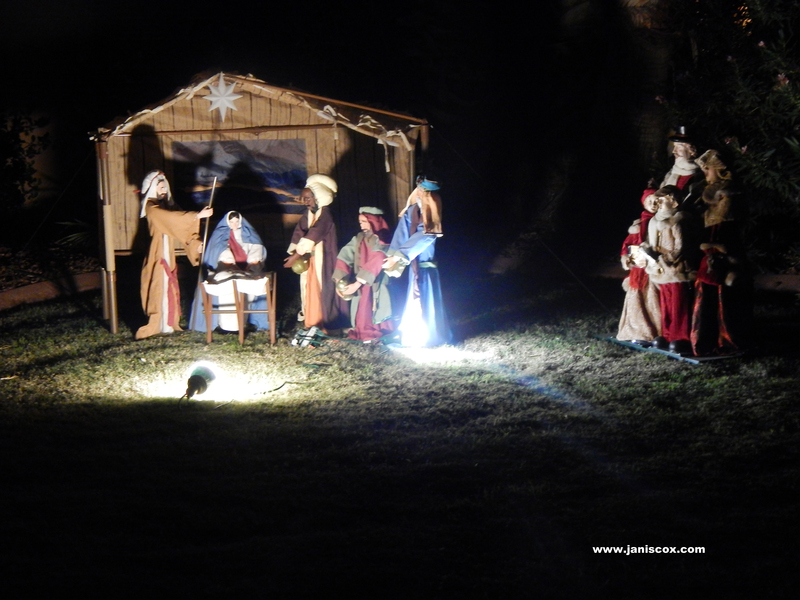 This past week I podcasted on Hope Stream Radio about HOPE – lighting of the first Advent candle. You can listen here. I talk about being counter-cultural. And I think that comes into each of the words of Advent – hope, love, joy and peace. Let’s help out. Let’s smile at one another. Let’s see the 1/2 full glass. I think if we can radically love, we can be radically generous of our time and God’s money. The question is not how much of my money I give to God, but rather how much of God’s money I keep for myself (Le Tourneau). And then we hear about Aleppo. What can I say but pray and pray some more. 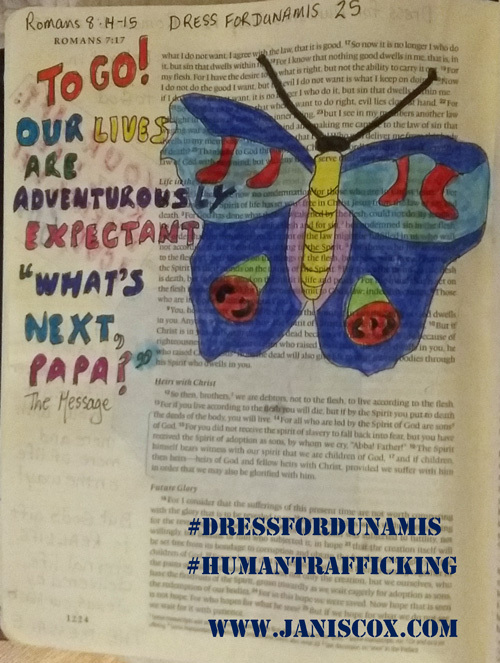 Personally I am working at “let’s love” by wearing a dress every day so I can fundraise for The Dunamis Foundation and pray for those caught in the evils of human trafficking. 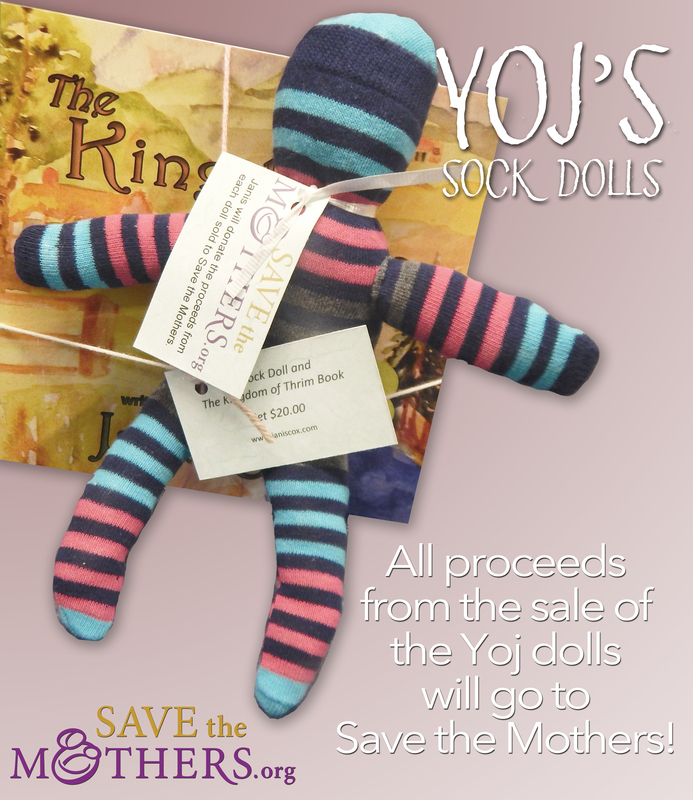 I am working on “let’s love” by making dolls to go with my children’s book The Kingdom of Thrim. The money will go to Save the Mothers. Join us with your posts about God. This entry was posted in Word of God Speak and tagged Advent, Christ-like, Ego, Jesus, love, Noah, redemption plan, relationship with God, self, Tozer on December 3, 2016 by JanisCox. Are we walking with baubles, bangles and beads? Or are we walking in the hope of our faith? Today I looked at HOPE as this is the first week of Advent. Our faith is built on hope. And during this Advent season I will light an internet candle each week to help me focus on the preparation of the true Christmas – the Incarnation – the coming of Jesus – man and God – to this earth! As we do this we walk among those who celebrate the season with baubles, bangles and beads. I love the book and the movie How the Grinch Stole Christmas. How the crassness of the season started to steal the Grinch’s heart and how he found out that the real Christmas isn’t in the stuff but in the hearts of those who celebrate it. We cannot get ourselves taken in with politics, commerce, and all the things that go on here. That doesn’t mean we can’t become involved but we need to do so in a Christ-like way. What we need to show is HOPE. for I have sought out your precepts (Psalm 119:45, NIV). But if we walk in the light, as he is in the light, we have fellowship with one another, and the blood of Jesus, his Son, purifies us from all sin (1 John 1:7, NIV). And this is love: that we walk in obedience to his commands. As you have heard from the beginning, his command is that you walk in love (2 John 1:6, NIV). And now, Israel, what does the LORD your God require of you, but to fear the LORD your God, to walk in all his ways, to love him, to serve the LORD your God with all your heart and with all your soul (Deuteronomy 10:12, ESV). they will walk and not be faint (Isaiah 40:31, NIV). and to walk humbly with your God (Micah 6:8, NIV). For we walk by faith, not by sight (2 Corinthians 5:7, NKJV). I have no greater joy than to hear that my children walk in truth (3 John 1:3, KJV). Walk in wisdom toward outsiders, making the best use of the time (Colossians 4:5, ESV). Through this walk one of the most important things I think is to be HUMBLE. Oswald Chambers calls this shallow – those every day duties and living, and to do it all for the glory of God. (1 Corinthians 10:31). It must be done gently, not arrogantly. With joy and peace, patience and understanding. This Hope, this being counter-cultural means acceptance of others. It does not mean hiding in a closet. It means following God wherever we are whatever we do. I can see that God has taken me on a walk today. He’ll get all the credit as the One might in everything (1 Peter 4:11, The Message). Walking towards Christmas. How are you looking at Christmas this year? Today is Word of God Speak. If you have a post about God please link below and then visit someone else. This entry was posted in Word of God Speak and tagged Advent, bangles, baubles, beads, Christmas, counter-cultural, hope, walk with God on November 26, 2016 by JanisCox.